From age old humans are curious about the mystery of the cosmos, the way in which they are held together, how it originated and so on. As time passed, they invented many different means to dig into the secret of the universe. Now, the ever enthusiastic scientists have developed an awesome technology to view the entire universe from a handheld gadget. 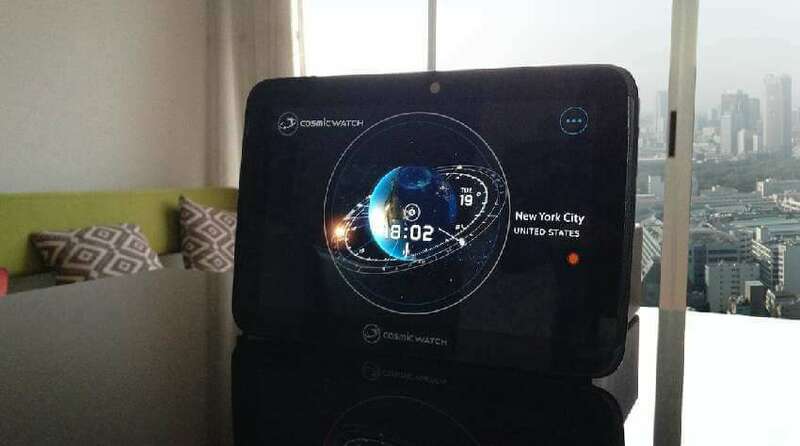 It is the Cosmic Watch – an app that enables users to explore the stars and planets in real-time. In this busy world, we limit ourselves with time. Time is something meant to schedule activities for us. But with the new app, the scenario has changed. With a few taps, the app displays the entire cosmos before you. The Cosmic Watch transforms the way in which you view time. This app allows viewing your relative position in the universe with respect to the cosmic bodies. One can also view the orientation of solar system in the past or can predict the next solar eclipse using this app. Eduardo Santana, Markus Humbel, Reto Spoerri, Andrea Ramirez, Guy Loretan and Marcel Grüter are the brains behind this marvelous app. The unique character they all have is curiosity. They started from scratch, co-coordinating with each other, resulted in the development of this outstanding application. Among the team members, the entire concept, content and design belong to Edward. “The COSMIC WATCH is a tool that helps us to connect with space, with our planet and with the present moment”-says Andrea. As the team defines, the app acts like an antikythera mechanism, i.e., an antique mechanical mechanism that was found in a shipwreck, meant to calculate the relative movement of stars and planet; an astrolabe, used to predict latitude and time and as a modern day yantra that acts like a tool for mediation. Humbel explains the Cosmic Watch as the first astronomical clock in the digital age. The Cosmic Watch has three operating modes; World Clock Mode, Astronomy Mode and Astrology Mode. The World Clock Mode allows users for time keeping centered on the atomic clock, Astronomy Mode helps to view constellations and the planets in the sky and the third mode enables viewing astral charts. While hearing the name Cosmic Watch, we expect a gadget like Apple Watch. But it is neither an app and nor available in Apple Watch. Humbel and the team will bring the fascinating app to Apple Watch soon. Cosmic Watch is available in the Google Play store and Apple Store for $3.99. The app will be a potential tool for educational and research purpose. Hope the app changes the ethics of modern people in viewing time. This is a fabulous and unique app for those ever enthusiastic tech savvy folks.